I hope you are all enjoying the weather. At least in my part of the world, spring is finally here. We’ve been waiting a while. April has been a quieter month overall, which was needful after March. I’ve been writing Abigail Rath Versus Mad Science, and in a surprise twist, I’m getting Abigail Rath Versus Blood-Sucking Fiends ready to send out and about. The Ankeny Book Fair went well, I did my stint with the flu, and we’re ready to move into May. 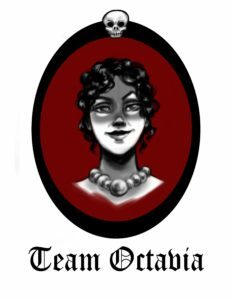 Thanks to Catrina Horsfield, an artist friend from my Sugar Quill days, we’ve designed a logo for those of you who might consider yourselves Team Octavia. Team Lucy is in development. I’ve already got a t-shirt, and I suspect this will ultimately be on bookmarks and stickers as well. Maybe, taking a page out of Jim Hine’s book, tattoos? Demicon in Des Moines, Ia, where I’ll be reading, signing, and on panels for Saturday, May 5th. Wiscon in Madison, Wi, my annual trip with my good friends Dan, Lisa, and Yolanda. I will be attending the whole convention from May 25-May 28, and I’ll be signing, reading, and on panels. As soon as I get a viable draft of Mad Science out to my readers, those of you who have been waiting for The Pawn of Isis, well, I’ll be back at it. Stay tuned. Here are Unreliable Narrators Podcasts for most of April! A large part of the joy of writing historical fantasy, for me, is the research. Although I also read letters, diaries, and newspapers from times and places equivalent to the historical setting I hope to use, the research tool I most enjoy using is obsolete travel guides. They have helped to spark my imagination and to improve my world-building. Some travel guides had life and death importance for travelers. The Green-Book, written, published, and revised by Victor H. Green from 1936 to 1963, helped African-American travelers survive the dangers of travel in the United States. Some travel guides are centuries old. The Periplus of the Erythraean Sea may date from the first century CE. To clarify, I don’t intend to get into the use of such important historical resources here. Instead, I plan to reminisce about the origin of my fascination with travel guides published to help their intended audience to negotiate travel for pleasure to a particular place for a particular year. My very first obsolete travel guide was a Ward Lock guide. This particular edition of The English Lake District, or to be exact, A Pictorial and Descriptive Guide to the English Lake District, with an outline guide for pedestrians and a special section for motorists, was published in U.K. in the early 1930s. I found the battered red book in a bargain bin at the excellent used bookstore nearest my college campus. I had no plans to write anything set in the Lake District, nor to travel in the Lake District, and at that point I sincerely doubt I knew where the Lake District was. As an avid reader of The Lord of the Rings, I had devoured many of the other titles Ballantine Books published in their fantasy line. Among them was E.R. Eddison’s The Worm Ouroboros. I found Eddison’s deliberately antiquated prose style difficult to read at first, but I think there was an element of the Ikea effect at work. Because I worked harder than usual to read that book, I connected with it more than the other titles from Ballantine. My love for Worm was cemented when I went to college and made friends* based on our shared passion for such novels. The Worm Ouroboros begins with these words: “There was man named Lessingham dwelt in an old low house in Wastdale, set in a gray old garden where yew-trees flourished that had seen Vikings in Copeland in their seedling time.” Wastdale is in the English Lake District. The index to the travel guide showed a reference to Wastdale, two for Wastdale Head, and two more for Wastwater. Intrigued, I read those entries, then went on skimming the guidebook. I was eighteen. At the time, the travel guide, which seemed antique to me then, was about thirty years out of date. Perhaps because it was missing one of its maps, it only cost me 75 cents. Its true cost was the time I took to read it, as I should have been studying instead. The guidebook had maps, photographs, detailed itineraries for hikers, and down-to-earth advice for the cyclists and motorists who were its intended audience. The hotels advertised had names straight out of Agatha Christie and Dorothy Sayers. As I read, I began to get a feeling for what it would be like to journey in this lost world. As a single woman, I thought I’d be more comfortable staying at a temperance hotel. I didn’t know how to drive, but that would present no problem. Walking holidays were popular enough to be catered for, so I could probably get a lift aboard one of the motor coaches that provided transport to the most popular sites. I would certainly obtain a letter of credit from a suitable bank. No travelers checks, or cheques, would be necessary. In addition to providing help envisioning concrete details of daily life, it is a great source for names. Place names can make good names for people, too. Most of all, the obsolete guidebook can inspire. This is from English Lake District again: “Another feature of the by-roads are the gates, which are generally kept closed to prevent sheep from straying, and which form a real danger to the unwary motorist.” I’m sure I could have imagined a chase scene on a rural road. I might even have imagined the sheep, but I would never have thought to imagine a closed gate across a road suitable for motoring. In Baedeker’s 1914 edition of Russia, the section on traveling in the Grand Duchy of Finland begins with this useful information: “In Finland Helsingfors (Helsinki) time is kept. This is 22 min. behind St. Petersburg time, 39 min. ahead of Central European time, and 1 hr. 39 min. ahead of W. European time.” I knew that time zones originated when scheduled train travel required such a thing, but not that the time intervals weren’t given in hours. It’s a world-building detail that would never have occurred to me. When I was writing A College of Magics, I found period guidebooks helpful when considering such vital questions as which hotel in Paris my protagonist would choose and how she would get to the railway station (and which railway station should it be?) when she needed to leave the city. Many years after that, my vintage copy of Baedeker’s United States told me what coins and currency were in use, common and otherwise, in 1905. 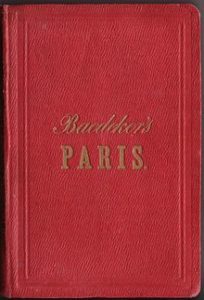 When my protagonist decided to ride the elevated railway in New York City, I knew how much the ticket would cost her (and what she should do with it), because my Baedeker explained that useful information in detail. That first 75-cent guidebook has led to my current shelf of battered Baedekers, fragile Satchel Guides, and other out-of-date handbooks for travelers. In recent years, I’ve been happy to find modern reprints, which let me use a book without ruining it (and also contain every single map). I may think I know precisely what I’m looking for in an obsolete guidebook, but I never know exactly what else I’ll find. * Ellen Kushner, I am thinking of you! Caroline Stevermer (b. 1955) is known for her historical fantasy novels for young adults. 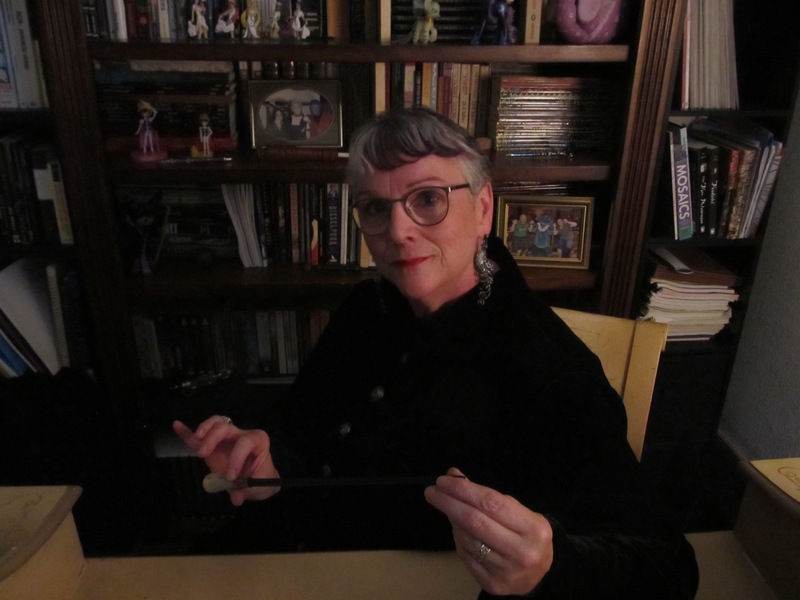 She published her first book, The Alchemist, in 1981, and before collaborating with fellow Minnesotan Patricia C. Wrede to create a magical version of Regency England. Stevermer graduated from Bryn Mawr College with a degree in art history and currently lives in Minnesota. When one is writing a family saga that takes place over 90 years, from 1837 until sometime in the 1920s, and one has been, in a previous life a costumer, one finds oneself interested in what people are wearing. Rather than dressing every one in pseudo-Victorian, I went out to do some research regarding fashion for men, women, and children, and take a look a fashion silhouettes of the various times I would be writing in. 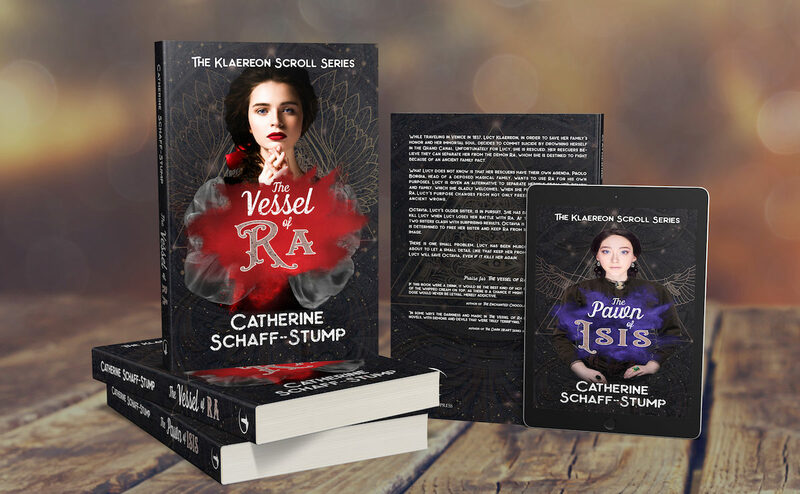 The Klaereon Scroll series starts in 1837, with two well-dressed gentlewomen, Octavia and Lucy Klaereon. 1837 is an interesting time in fashion. The Neo-Classicism of the Regency with its minimalist structure has given way, twenty years later, to a less basic shape as women embrace the ideals of a tiny waist and a larger skirt. 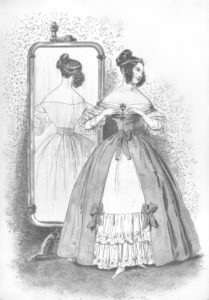 In the evolution of the silhouette, we can see our way toward the giant hoops of the 1850s, as the skirt ever widens, and toward the constricting corsets of the 1860s-1880s, as the waist narrows. The resulting hourglass figure would continue to become more exaggerated until the first bustle brought in some variety around 1870. The foundation upon which this silhouette was built consisted of a chemise, covered by a corset, which cupped the breasts. Petticoats padded the skirt and held the corset in place. Of particular interest at this time in fashion is the evolution of the sleeve. The sleeve of the early 1830’s was full at the top, but as the decade progressed, the fullness of the sleeve moved down the arm. The necklines emphasized a feminine sloping shoulder, and gowns around the neck and bust were increasingly fitted, while lower arms were plumped out and supported by sleeve plumpers. Points tailored toward the waist emphasized the sloping shoulders and smaller waist. Necklines were lower for eveningwear than daywear. Hair was parted in the middle and coifed in ringlets on the sides and sometimes the top of the head. Rakish hates of earlier in the decade gave way to primmer, more feminine bonnets. Slippers completed evening ensembles. Button boots with elasticized insets appeared for daywear. As fashion goes, these clothes were less prohibiting than some of the silhouettes that would come later, but women were losing ground on the way to some of the most constricting fashion choices that would not be modified until after the first world war.